This is a go-to summer best. It travels well so it’s a great one to take along to the potluck invitation. It’s also best eaten within 24 hours. Heat the oven to 400 degrees F. Peel and slice the onions into 1/2-inch rings, and then arrange on a rimmed baking sheet. Drizzle the onions with 2 tablespoons of the olive oil, sprinkle generously with salt, and smush everything around to coat the onions on both sides. Roast them for about 40 minutes, flipping them over halfway through, until they’re brown and soft. Let the onions cool and then roughly chop them. Set aside. Dice the squash into ¼ inch pieces and put it in a large bowl; you should have about a cup. Strip the kernels from the ears of corn and add them to the bowl with the squash. Finely chop the scallions and add to the bowl. Halve the tomatoes (or quarter them if they’re bigger than a cherry) and add them to the bowl. Add the chopped roasted onions, a tablespoon of olive oil and a few pinches of sea salt and pepper. Stir everything together gently. In a small bowl, whisk the vinegar with the honey; whisk in the remaining 2 tablespoons of olive oil. Stir about two-thirds of the dressing into the salad, taste, adding more if you like and adjust for salt and pepper. Roughly chop the basil, stir it into the salad and serve. Serves 6. We updated this retro recipe – from Julia Child in the 60s – with modern touches like a little hit of curry, cayenne and lemon zest. These deviled eggs have summer picnic written all over them and with addition of pureed vegetables, they pack a lot more nutrients than more traditional deviled eggs. Prepare the asparagus: Remove tips and reserve. Cut stems into 1-inch pieces. Bring a pot of water to the boil, drop in cut-up asparagus stems, reduce heat to a simmer, and cook until tender, four minutes. Remove cooked asparagus with a slotted spoon, reserving water, and plunge the pieces into cold water to stop the cooking. Drain thoroughly and lay them out on a paper towel to dry further. When dry, transfers chopped asparagus to a food mill or food processor; process until pureed or very finely chopped. Pass puree through a sieve as necessary to drain of any excess water. Bring water to a boil again and add asparagus tips; cook until crisp tender and bright green, about one minute. Drain through a sieve and plunge the sieve into cold water. Finish drying the tips on paper towels. Prepare eggs: Peel your eggs. For a cleaner cut, dip your knife in water before cutting each in half lengthwise. Shave a thin strip off the bottom of each so that it will not rock about in its dish. Remove the yolks and press them through a fine-mesh strainer to sieve them, or mash with a fork. Add asparagus puree, shallot or chives, mayonnaise, Dijon, spices, lemon zest and combine mixture until smooth. If the mixture is dry, add optional cream, or water, to achieve the right consistency. Season carefully with salt and freshly ground black pepper. You can spoon the mixture into each egg half, or use a piping bag with a star tip for a fancier presentation. 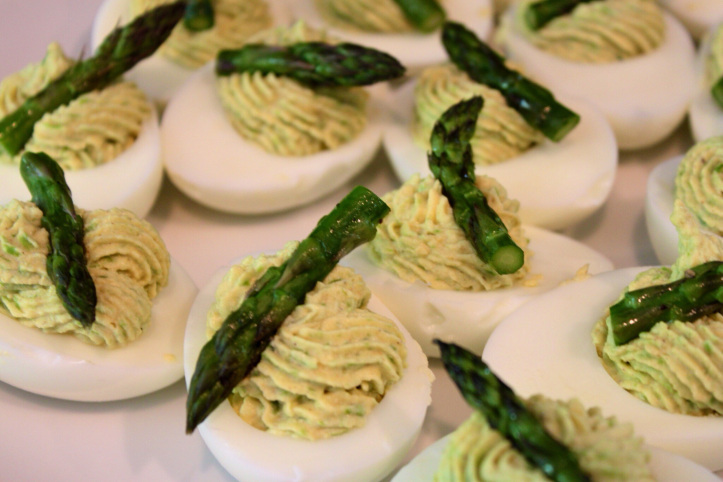 Decorate each stuffed egg with asparagus spear. Wrap tray in plastic and keep in fridge until ready to serve. Makes 24 stuffed egg halves. Peel carrots and slice larger ones lengthwise so they are fairly uniform. Split chard stems as needed to achieve similar uniformity. Bring a large pot of water to boil and add the carrots. Cook for about 5 minutes, remove and cool in an ice water bath. Cook the chard in the same boiling water for 3 minutes, remove and cool in an ice water bath. Whisk together the remaining ingredients in a bowl. On a plate, arrange the carrots and chard by color. Drizzle dressing on top and sprinkle mint leaves. Serve cold or room temperature. This recipe will convert eggplant doubters into fans. Don’t overcook the eggplant – it should be grilled until done all the way through and pulled quickly before it begins to fall apart. And if you don’t want to grill, eggplant rounds can be oven-roasted. 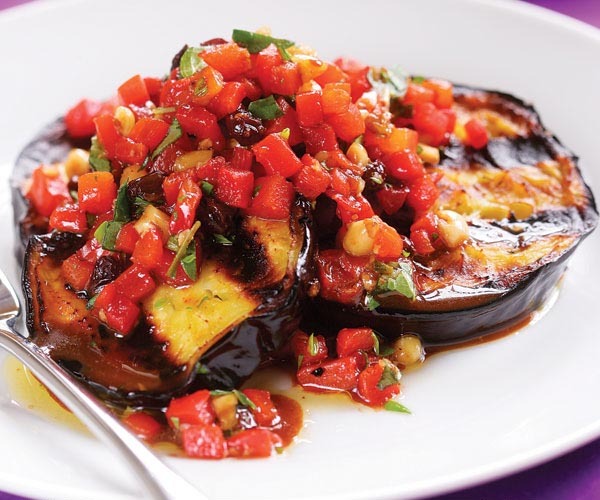 The relish, which can be made ahead of time to speed preparation of this dish, really underscores the flavors inherent in the eggplant – the sweetness and nuttiness – while pleasing the palate of the steak lover. I know this one is a winner because husband Joel – never a fan of eggplant – went for seconds. This recipe comes from Fine Cooking, with modifications from us. Combine the currants and both vinegars in a small bowl. Mash garlic and salt into a paste. Cut roasted pepper into very small dice and put in a medium bowl. Add 1-2 T juice from the pepper. Add the currants and vinegar, garlic paste, pine nuts, olive oil, marjoram, and cayenne and stir. Season to taste with salt and cayenne. Prepare a medium-high charcoal or gas grill fire or use a grill pan, set at medium-high. Brush both sides of the eggplant slices with olive oil and season with salt. Grill until golden-brown grill marks form, 3 to 4 minutes. Turn the eggplant and grill until tender and well marked on the second sides, 3 to 4 minutes more. The interior should be grayish and soft rather than white and hard. When ready to serve, stir the relish again and spoon it over the grilled eggplant, or serve it on the side. Garnish with parsley, if using.